I was reading the white paper that is reachable from this site that our colleagues in the UK launched today. It is about removing IT from the boardroom agenda, which is a little counter intuitive. As IT professionals we do want IT to be strategic to our business but too often we end up on that agenda for the wrong reasons: budget overruns, application outages, delays and so on. Customers move into this stage when they first virtualize a mission critical application or database. When we talk to customers who are in this phase, we hear that the predominant reason why they do this is to achieve better business continuity and quality of service for their business applications. These customers have a higher level of sophistication compared to the ones that are still in the consolidation phase. They still enjoy cost saving from consolidating servers but that is not the driving business proposition enymore. They are now addressing another big board room level concern: business continuity. 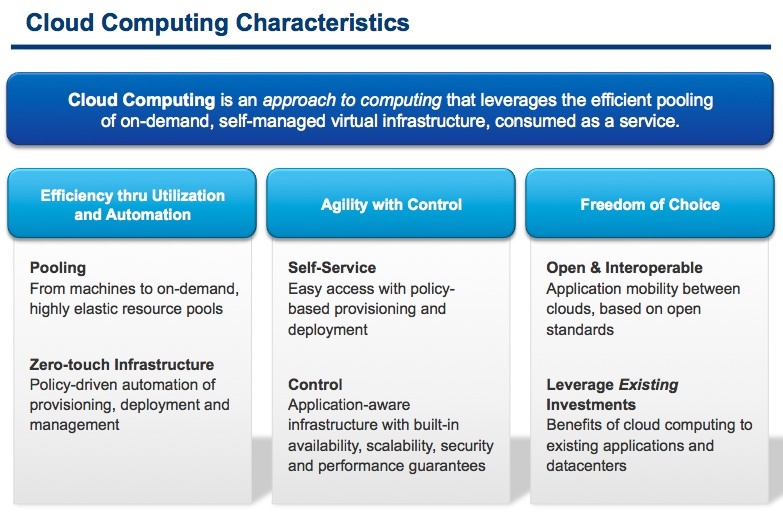 then they nod their head and generally agree that this is what they are doing through their virtualization journey. Indeed if we agree on the above definition of cloud computing, then you can see how customers are already building the foundation for their cloud even in the early stages by creating the abstraction and pooling layer through virtualization. Then they tackle the service layer and quality of service (Control) in the Business Production phase and finally move into Zero-Touch Infrastructure as they achieve higher level of provisioning, self-service, management and scaling automation in the ITaaS phase. Much more on topic later. The increased level of automation achieved in this later stage gives our customers a much more agile IT infrastructure which helps them address two additional concerns of the board room: time to market for business services and applications and the ability to respond faster to changes in business requirements. So, based on what we learned from our most advanced customers, there is a strong correlation between their level of adoption of virtualization technology and private cloud computing and their ability to be on the board room agenda for the right reasons. Stay tuned as I get permission to publish the details of some of these customers stories in the near future. I wanted to know your thoughts on the following Gartner report -> http://www.gartner.com/it/page.jsp?id=1322414 . What do you think are some of the precautions/developments being done by different companies in order to counter these issues w.r.t security.